Did you Angelenos feel the chill in the air yesterday morning? I thought we’d have a few more weeks of heat, but like clockwork summer has given way to fall. And where I live fall means tailgating. 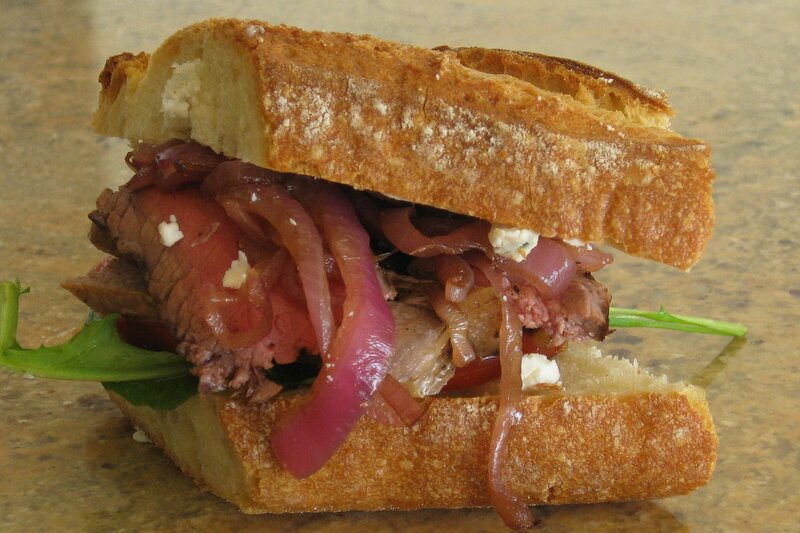 The robust flavors of this steak, balsamic red onion, blue cheese and arugula sandwich anchor my fantasy tailgate picnic. It looks très chic wrapped in parchment paper and shared on a tartan blanket with a thermos of hot toddies and, for game-time snacking, brown paper lunch bags of this amazing caramel corn. You can make and wrap the sandwiches the night before. Just be sure to pack your picnic in a cooler so the blue cheese doesn’t sit out under the September sun. Pull the sandwiches from the cooler 15 minutes before enjoying to take off the chill and let the flavors warm. Heat 1 tablespoon olive oil in a small pot over medium heat. Stir in the onion and turn the heat to low. Let the onions cook, stirring occasionally until soft and caramelized, about 15 minutes. Stir in the balsamic vinegar. Cook until the vinegar is absorbed, about 5 minutes more. Season to taste with salt and pepper and remove from the heat. Season the steak with salt and pepper on both sides. Heat 1 tablespoon olive oil in a medium saute pan over high heat. When the pan is just about to smoke, add the steak and sear on one side, about 1 minute. Flip the steak and sear on the other side, about 1 minute more. Lower the heat to medium-low and continue cooking, turning once more midway through, until the steak is rare in the center, about 8 minutes. Remove the meat from the pan and wrap in foil to rest. Once steak is cool, about 15-20 minutes, slice into thin strips. Cut your baguette into 3 equal portions then slice each piece lengthwise. Make a pillow of arugula on the bottom half of each baguette portion. Top with tomato, then steak and onions. Smear the top half of each baguette with slices of blue cheese to taste. The blue cheese will crumble (see photo). Just stick the crumbles back in the sandwich somewhere. Top the sandwich with the blue cheese baguette slice and gently press down to make the sandwich stick. Wrap in parchment paper and enjoy immediately or keep chilled until ready to enjoy, up to 1 day.